The Volume2 is a highly linear design (output spectra are shown at close to normal 2V output level). Only 50Hz harmonics protrude from the –120dB noise-floor. This level of performance is comparable to the most expensive preamps in the high-end sphere. Sound: Beyond design purity, would it be soda or water? Pure aqua. The core feature of the SPL is neutrality. I have heard many preamps with great resolution and a profusion of detail. The Volume2 adds a further degree of tonal veracity. In one sense, it seems very close to the mythic straight wire with variable gain. Unlike most tube preamps, the SPL doesn't enrich harmonics or create euphonic colorations to increase sustain and decay. Unlike a large number of solid-state preamps, the Volume2 does not sound clinical with unnaturally fast transients and limited decays. The SPL is distinctly anti excess. It delivers an uncut rendering of your records, be those good or bad. Hence it’s no joy rider which mocks up a convincing live sound with specific colorations. Certainly with the Volume2 a studio recording won’t sound live. If you are after this incomparable sensation of presence and warmth in your listening room, forget the SPL. The very best tube preamps offer better flesh on sustain and decay. The SPL is amazingly quiet and transparent and its dynamics are fully commendable. It is able to reproduce with great accuracy low-level microdynamic shifts; to distinguish subtle tonal nuances; and to deliver fast attacks. 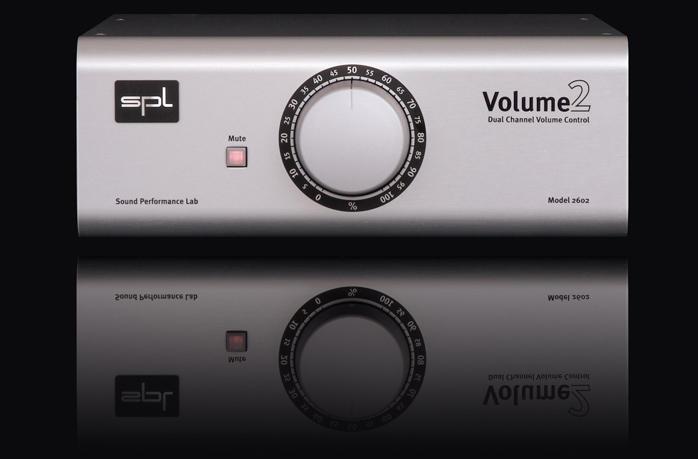 It is not a demonstrative or impressive device but in the longer run, the SPL makes the difference when you gain greater insights into how each recording is unique. The Volume2 won't cast the giant three-dimensional soundstages of the best valve preamplifiers but nonetheless delivers good breadth and depth. The overall equilibrium, good dynamical reflexes and stunning transparency make the SPL particularly enjoyable with live recordings. Quite often you have the choice between a very dynamic but aggressive sound with poor tone or good timbres with a big loss in dynamics and soundstaging. With the SPL, everything seems in the right place wisely calibrated.